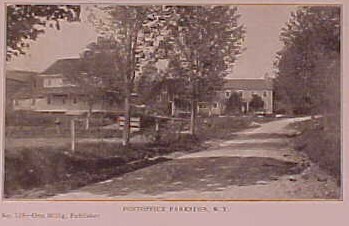 Parkston NY was first settled in about 1850 when the timber was in high demand for construction of homes, fuel for heat and extraction of chemicals in the acid factories. At first the logs were lashed together into "ponies" and floated down the Willowemoc and into the Delaware River with a destination as far as Philadelphia. With the advent of the railroad in Livingston Manor in 1870's, the demand was for lumber that had been sawed up and it was found to be much more profitable to saw it at the location of the logs rather than the uncertainty of floating logs down the river. 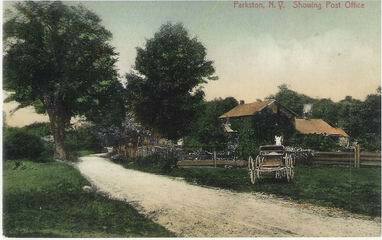 William Parks and his brothers owned most of the timber rich land in Parkston and constructed a sawmill. They built a pond for power, houses for its workers and farms to supply food to the workers. By the 1890's, the timber was depleted and the area became a more of a farming area with 5 farms covering most of the area. The pond became a easily available source for ice and several ice houses were built around the pond. George and Matilda Barnhart moved from Dalia and bought the William Parks house and raised their family there farming during the 1890's. At the turn of the century, the area started to be an attraction as to people who wanted to spend the summer in the mountains. 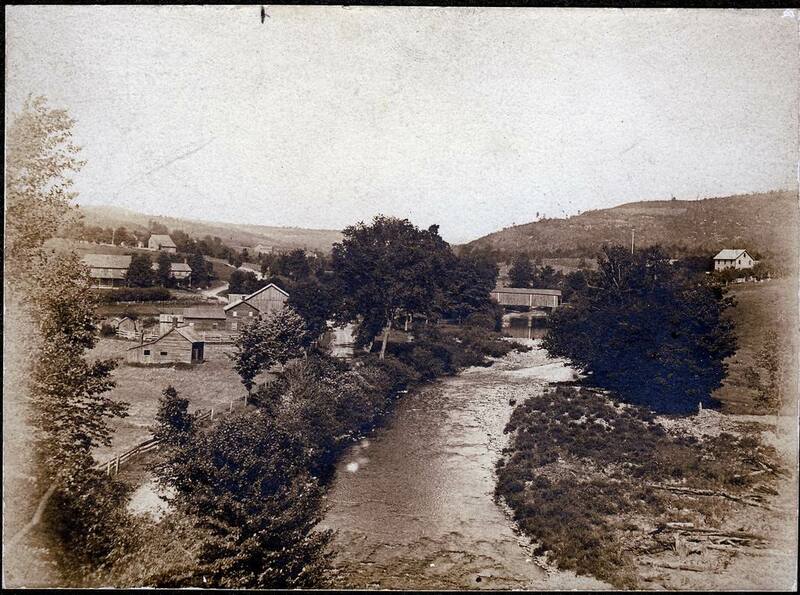 Farms like this became boarding houses with easy access from New York City by the way of the O&W railroad. The owners often gave their rooms up in the Summer to make room for more boarders. The population grew and was in need of a post office. 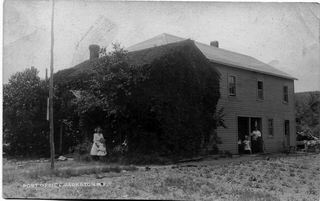 The George and Matilda Barnhart farm to the left was used as the post office with George as the Postmaster. 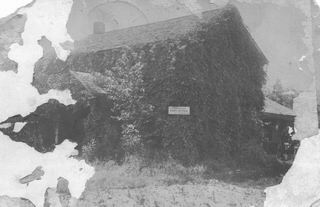 The picture on the right shows the vine-covered Post office as it appeared in about 1910. The sign on the corner says Parkston Post Office G. a. Barnhart P.M. The children of George and Matilda were grown and married but George was still the Postmaster and Matilda was running a very profitable boarding house. By this time, the Parkston area had several farms turned into boarding houses but there was a need for more so George and Matilda decided to expand the farmhouse to make more room for boarders. Their daughter Lillian and husband Wiley Lacey came to live and help too. Money was borrowed and a large addition was added to the back of the building to house many boarders as well as room for the expanding family of Wiley and Lillian Lacey. 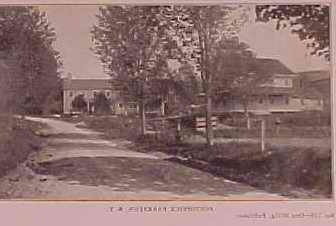 The Postcard picture to the left is shortly after the addition was completed in 1913. 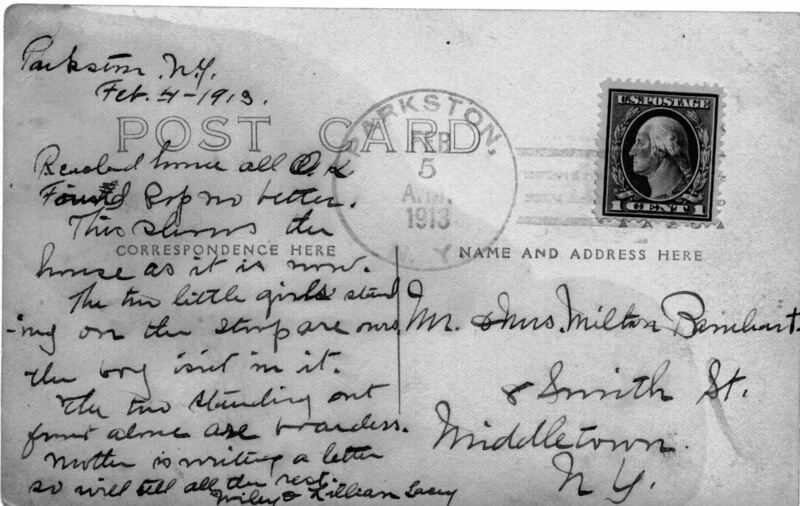 Matilda had become the Post Master after George became ill. Lillian Lacey is standing in the doorway to the right with he two oldest daughters, Vera born 1906 in Livingston Manor and Margaret born 1908 in Livingston Manor. The two girls in front are summer boarders. The Postcard was written by Lillian Barnhart Lacey and mailed from Parkston to Milton Barnhart in Middletown who was either a cousin or a brother who has not been identified. Found Pop (George Barnhart) no better. This shows the house as it is now. The two little girls (Vera and Margaret) are ours - the boy (Clifford) isn't in it. The two standing out front alone are boarders. Mother (Matilda) is writing a letter so will tell all the rest. George Barnhart died the next year in 1914 and Matilda continued as the the postmaster and running the boarding house with the help of her daughter Lillian. Wiley was working on the railroad and their sons Clifford and George) took over the job of running the farm. By 1928 they had a total of 12 children and the boarding house business was booming but people were looking for more than a farmhouse to stay in. Four small hotels were built within a mile which attracted some of the more wealthy boarders who wanted swimming pools, tennis courts, Kosher food and other services that were not available from the smaller boarding houses. The depression of 1929 came and the boarding house business was greatly reduced with only the wealthy going to the hotels. The farm and Wiley's railroad income were hardly enough to pay any rent but as all the others at that time they managed. Matilda Barnhart still owned the house but went to live with her other daughter Greta Barnhart Porter and her husband Otis Porter in Middletown. Otis had a body and fender repair shop that was doing well until the depression but went into debt with the risk of losing his business and house. 1. Two of the young Lacey children went back to the house to get some fireworks from the closet and started a fire that wasn't noticed for an hour. 2. A red pick-up was seen speeding by the Casino from the Beaver Lake road.. The fire was then discovered shortly after the car went speeding back. The fire could have been set to collect the insurance which was held by Matilda Barnhart who was living with Otis Porter and his ailing car repair business. His business recovered shortly after the fire. Everything was lost to the fire and the Lacey family had only what they were wearing that day and no place to live. They moved to Parksville next to the railroad tracks over Bagley's house. Lillian got $100 from he Mother Matilda for the contents lost to the fire and Otis gave the kids presents (BB gun to Harold the youngest). Shortly after the fire Matilda gave the farm to Lillian Barnhart Lacey and they mortgaged the land for materials to build a house. They moved to Old Morsston on the Beaver Lake road and Sons Clifford and George built most of the house with the help of a local carpenter Jim Pangram. The porch was a little more difficult and their Uncle Scott Lacey came from upstate and built the porch and sidewalk. 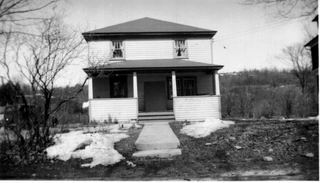 Even though the house was built in the mid-1930's it still had an outhouse and icebox for a refrigerator and no electric. The water was from a hand-pump from a pipe driven i the ground. 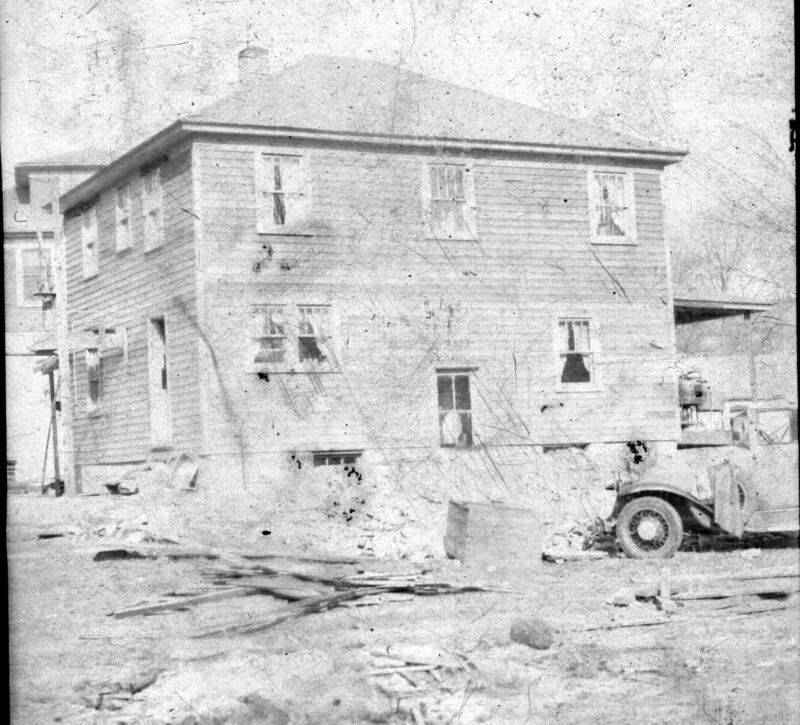 The family moved in long before the house was done and they continued to finish the house. The job of the two youngest boys was to get ice from the icehouse in the back and load it into the icebox on the back kitchen and it wasn't until the end of WWII that an electric refrigerator was purchased and electric wiring was completed after son George came home from the Army.